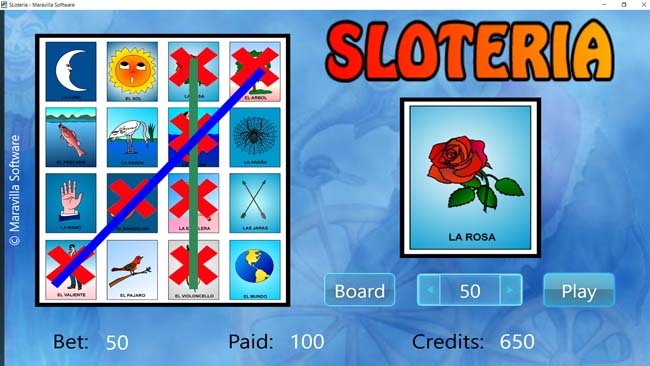 SLoteria is a slot machine game that use the Loteria Mexicana cards or Mexican bingo to play Vegas style. At start up you'll get 1000 points credits, your stating bet is 5 points but you can increase or decrease the number. To play, touch the Draw button and wait for the 25 cards to be drawn and marked the ones that match on the board. To change the playing board touch the Board button. This is a free demo of the game hope you like it and leave feedback. The images are part of the software package called Loteria Workshop.